WHITE PLAINS, N.Y., July 19, 2006 – The USTA today announced that two-time defending US Open champion Roger Federer will lead the men’s singles field for the 2006 US Open Tennis Championships, which will also feature former US Open champions Andre Agassi, Lleyton Hewitt, Andy Roddick and Marat Safin. The 2006 US Open will be played August 28 – September 10 at the USTA National Tennis Center in Flushing, N.Y. The US Open Men’s Singles Championship is presented by Lexus. Both the men’s and women’s US Open singles champions will earn $1.2 million with the ability to earn an additional $1 million in bonus prize money (for a total $2.2 million potential payout) based on their performances in the US Open Series. In addition, both US Open singles champions will receive a new Lexus GS 450h automobile. Thirty countries are represented on the entry list, which includes all top 100 ranked players. Leading the entry list is world No. 1 Federer of Switzerland, the two-time defending US Open champion and reigning Australian Open and Wimbledon champion, who will seek to join Ivan Lendl (1985-87) and John McEnroe (1979-81) as the only men to win three consecutive US Open men’s singles titles in the Open Era. Following Federer on the entry list are No. 2 Rafael Nadal of Spain, the reigning French Open champion; No. 3 David Nalbandian of Argentina; No. 4 Ivan Ljubicic of Croatia; No. 5 Nikolay Davydenko of Russia; and No. 6 James Blake of Fairfield, Conn., the highest ranked American on the entry list. No. 20 Andre Agassi of Las Vegas, Nev., the 1994 and 1999 US Open champion, announced he will retire after this year’s US Open, where he will make his 21st consecutive appearance, passing Jimmy Connors’ Open-Era record. Other American men who received direct entry into this year’s tournament include No. 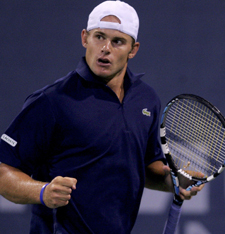 11 Andy Roddick of Austin, Texas, the 2003 US Open champion; No. 17 Robby Ginepri of Marietta, Ga., who reached the semifinals at the 2005 US Open; No. 66 Mardy Fish of Tampa, Fla.; No. 75 Paul Goldstein of San Francisco, Calif.; No. 85 Justin Gimelstob of Morristown, N.J.; No. 90 Kevin Kim of Newport Coast, Calif.; and No. 94 Vince Spadea of Boca Raton, Fla. In all, there are ten entrants who have won Grand Slam singles titles in their careers, including: 2004 French Open champion Gaston Gaudio of Argentina; 2003 French Open champion Juan Carlos Ferrero of Spain; 2002 Australian Open champion Thomas Johansson of Australia; and 1998 French Open champion Carlos Moya of Spain. Fernando Vicente of Spain, ranked No. 101, was the 104th and last player accepted directly into the men’s field of 128 (Joachim Johansson of Sweden; Jiri Novak of the Czech Republic; and Mariano Zabaleta of Argentina all used protected rankings). Sixteen more players will gain entry through the US Open Qualifying Tournament, August 22-25, while the remaining eight spots are wild cards awarded by the USTA. The July 17 edition of the ATP Rankings was used to determine the US Open main draw entry list. Seedings will be based on the August 21 rankings. The US Open draw will take place Wednesday, August 23. The 2006 US Open will mark the culmination of the US Open Series, the six-week summer tennis season linking all major ATP and Sony Ericsson WTA Tour tournaments in North America to the US Open. The US Open is the highest annually-attended sporting event in the world. More than 87 million viewers watched the 2005 US Open on CBS Sports and USA Network, and international broadcasts reached 184 countries. In 2005, Roger Federer defeated Andre Agassi to win his second consecutive US Open in a men’s final that saw domestic television ratings double from the previous year. In the women’s singles final, US Open Series winner Kim Clijsters defeated Mary Pierce and – along with her US Open Series bonus – collected $2.2 million in prize money, the highest-payout in the history of women’s sports. The 2006 US Open will be held Monday, August 28 through Sunday, September 10. Tickets for the 2006 US Open can be purchased four ways:	1) at usopen.org; 2) by calling Ticketmaster at 1-866-OPEN-TIX; 3) at all Ticketmaster outlets; or 4) at the USTA National Tennis Center box office. American Express is the Official Card of the US Open.